This week is the American Library Association’s Preservation Week. 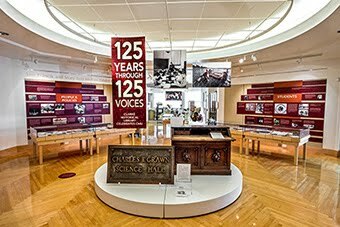 It is a week designed to highlight all of the complexities that are involved in preserving the objects of enduring cultural value that are stored in libraries across the United States. The goal is to raise awareness and give educational opportunities to those who care about preserving all forms of information – from priceless antiquarian books to the latest presidential tweet – for generations to come. As part of the Clarke Historical Library’s mission to keep and make available resources related to the history of Michigan, we are involved in a very large project to preserve local newspapers from throughout the state. Newspapers, as many of us have seen, do not do a good job of withstanding the test of time. They tend to become acidic over time and they will eventually become yellow and brittle and, in the advanced stages of degradation, they can begin to crumble with even the slightest touch. To ensure that researchers have access to old newspapers without worrying about deterioration, the newspapers must be preserved. The primary way that we preserve newspapers for future use is to photograph them and store them on microfilm. While it seems that everything is going the digital route, analog preservation microfilming is still a preferred method for keeping information well into the future. The advantages of microfilm include that it is static and cannot be changed (i.e. it is exactly the same as when it was created), it will last for over 500 years if it is stored and maintained properly, and it doesn’t require any special equipment other than something to magnify the image unlike digital documents which require computer software or a special player. At the Clarke, our preservation microfilming unit uses state-of-the art equipment and techniques that meet or exceed American National Standards Institute (ANSI) specifications for preservation microfilming. We work with several libraries and newspaper publishers to create high quality, enduring, accessible copies of historical and contemporary newspapers. Many of our projects are continuing and we have standing orders to microfilms all copies of specific publications. On average, we process 100,000 images on microfilm each year. After the pages are filmed and inspected, multiple copies of the film are created and stored in climate-controlled secure locations, both in-house and offsite. We also work with libraries and other clients to distribute user copies of film. The redundancy of multiple copies ensures that if one copy is ever damaged, there will be a backup available, and if one storage location suffers a disaster, all of the copies will not be affected. 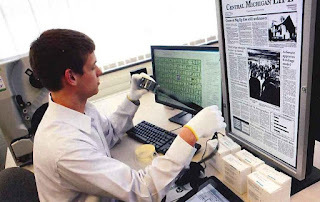 Besides newspapers, the Clarke Historical Library preservation microfilming unit works with documents, manuscripts, and scrapbooks to reformat the information. We offer institutions across the World the opportunity to purchase user copies so their researchers can remotely access the unique holdings of the Clarke Historical Library. 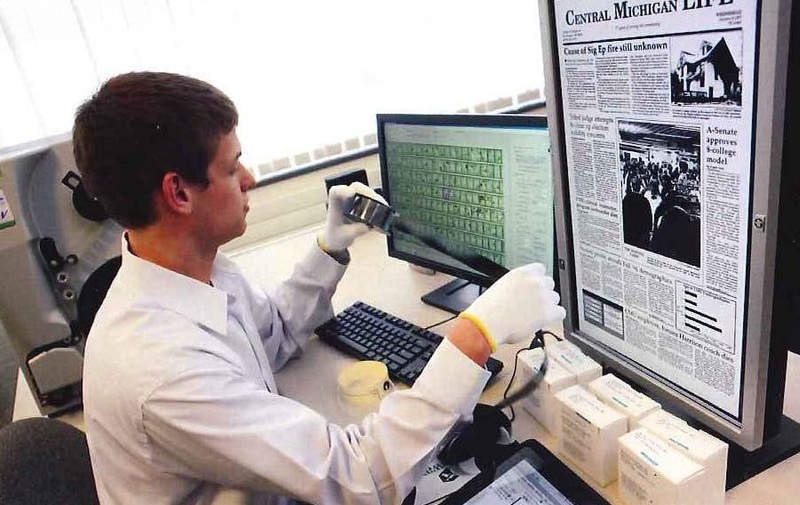 If you are interested in further information about preservation microfilming in general, please see this Northeast Document Conservation Center Preservation Leaflet regarding preservation microfilming. If you would like further information about working with the Clarke Historical Library to preserve documents or newspapers that are in need of reformatting, please visit the microfilming unit’s webpage or call us at 989-774-3352.